The landscapes in Edvard Munch’s work have long been understood to reflect his psychological and emotional states, a correlation that remained consistent even as his style changed over the course of his career. One frequently recurring motif in Munch’s life and art is the sea, both coastal settings and the many fjords carved in the Norwegian landscape. 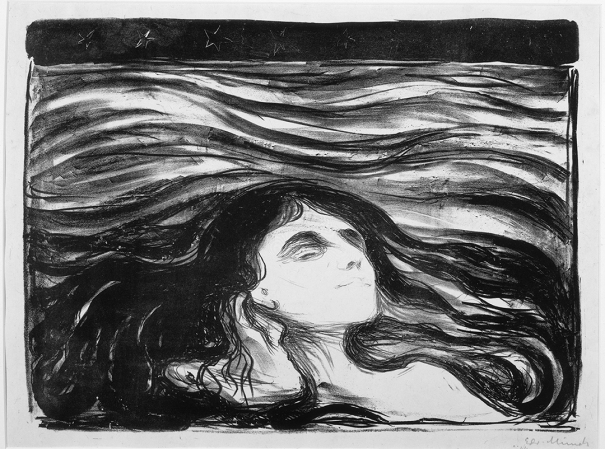 Edvard Munch and the Sea will offer a focused exploration of this motif in Munch’s images which ranges from a stand-alone subject to a backdrop for summer holiday makers to dramatic reflections of a work’s psychological, emotional, or symbolic underpinnings. The exhibition is organized in conjunction with the 125th anniversary of the founding of Pacific Lutheran University in Tacoma, celebrating its Norwegian roots. Edvard Munch (1863-1944), On the Waves of Love, 1896. Lithograph, 12¼ × 16½ inches. Epstein Family Collection, EFC 073.0. Photo by Mark Gulezian. © 2016 Artists Rights Society (ARS), New York.